Accused Wednesday 7th August 1872 of selling beer at unlawful hours on Sunday 4th August. Two men had been seen drinking in the house between 10 and 11 in the morning. On Thursday 8th August the Bench did not believe the evidence given by one of the men and claimed `he had been tampered with' . Mr. Bugg was fined £1 and costs of 14s 6d, or in default on month. Convicted 20.07.1907 of selling to a drunken person. 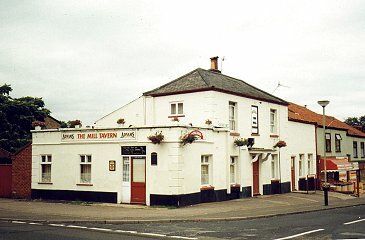 A very complete Public House, known by the sign of the MILL TAVERN, with a Cottage, situated in the Catton Back Road, to be Sold by Auction, Thursday 1st June 1820. Landlady Jacqueline Denton was found on the premises 25th March 2001, having been murdered. Her assailant received life imprisonment. Application to convert into flats made during Autumn 2004. Bar, snug and smoke room knocked into one within the last ten years..
Adjoining cottage knocked through to extend lounge area. Some etched glass saying `S&P'. Active Bowls and Angling Clubs.